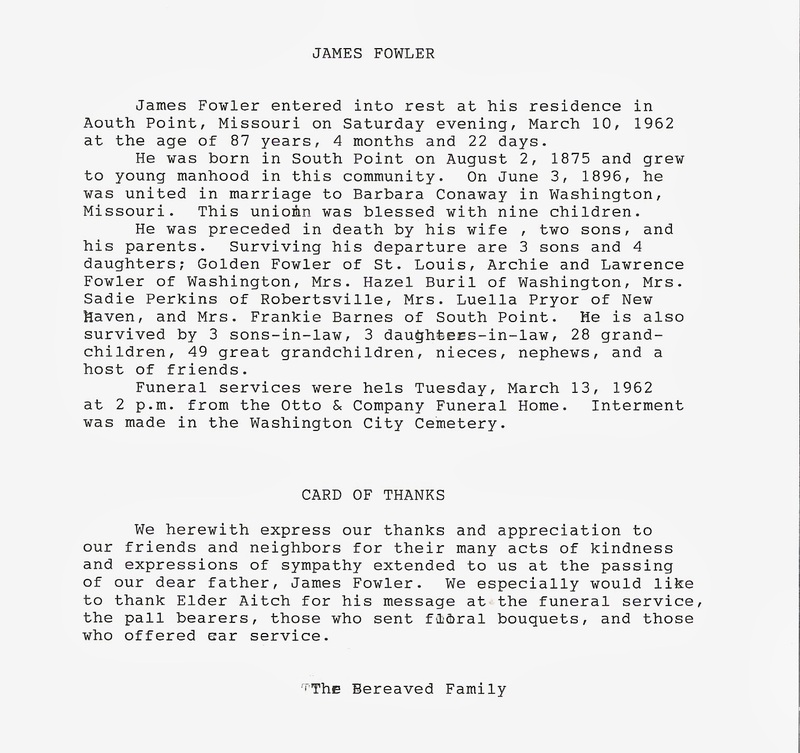 My relationship with my paternal grandmother Luella Evandle FOWLER was different than most. Because I never once met her. Something that I never fully understood. Growing up, my sisters and I only knew her through phone calls and letters. Mom would call her and put us on the phone. She would always talk to us about our father, her son. She would tell us that he loved us girls in spite of his absence in our lives and that we should always be sweet to our mother. Looking back, I am thankful for the many conversations that I did have with her. However, it was one conversation that gave me the pieces to this family puzzle and started me on my journey. At sixteen, my habit of writing everything down was just beginning. I still have the notebook that I took notes in during our conversation all those years ago. I guess that being a "Pack Rat" has it's benefits.. Little did I know that this would be the last time that we spoke. I remember our conversation like it was yesterday. She started by telling me when she was born, November 5, 1910 to James Fowler and Barbara Christine CONNWAY. She married Ollie Taylor, her first husband about 1926. She married her second husband Paul C. Pryor, in the 1930's. Her family was from Missouri. Most lived in Frankilin county. The towns of Washington, South Point, Pacific. Also, Boonville and Webster Groves. Her siblings were; Golden, Lawrence, Hazel, Charles, Sadie, Archie, Barney and Frankie. She told me that her maternal grandmother was a slave. Her name was Mariah CONNWAY and even though she looked like a white woman she was still sold into slavery. Mariah's mother was an enslaved woman named Myra HALL. Myra was born about 1807, some records say Kentucky and some Virginia. She is thought to have been owned by a German slaveholder in Missouri. Like her daughter, Mariah, she also was very fair and looked white. Grandma Luella continued to give me more information, telling me about the day my father was born..in a little shack of a log cabin along side of the Missouri river in Washington..all I could say was Wow! I was amazed as I later found that my grandmother's family stayed in the same location generation after generation. The only ancestors in my entire family on all sides that stayed in the same area after years after slavery ended. They never left. 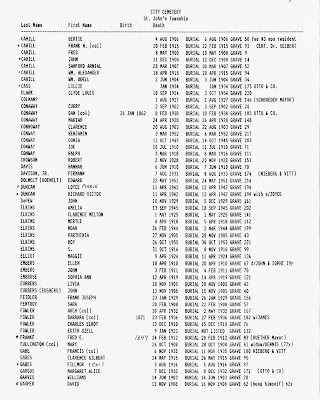 I have located most of them in Franklin county records from 1870-1940. I few years ago I posted a message to the message boards. 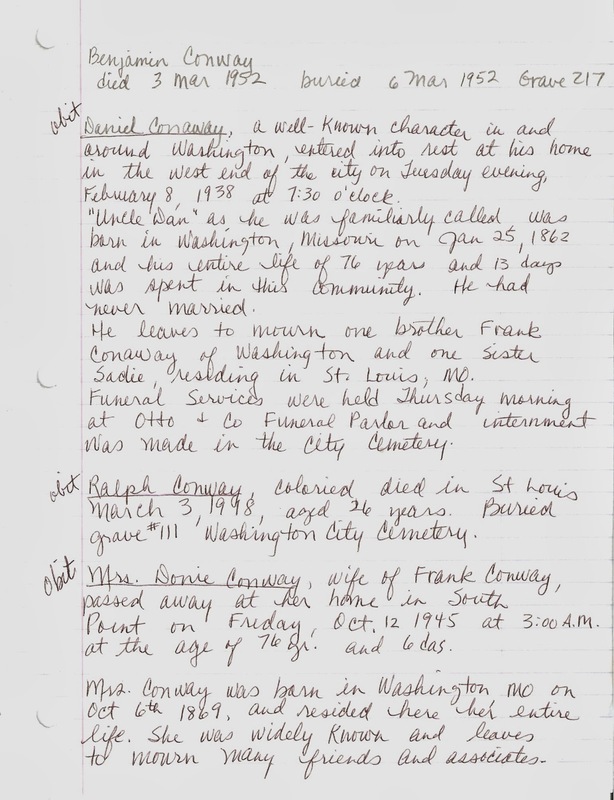 I had found many death records on the Missouri Digital Heritage website, an absolutely wonderful site for Missouri research. 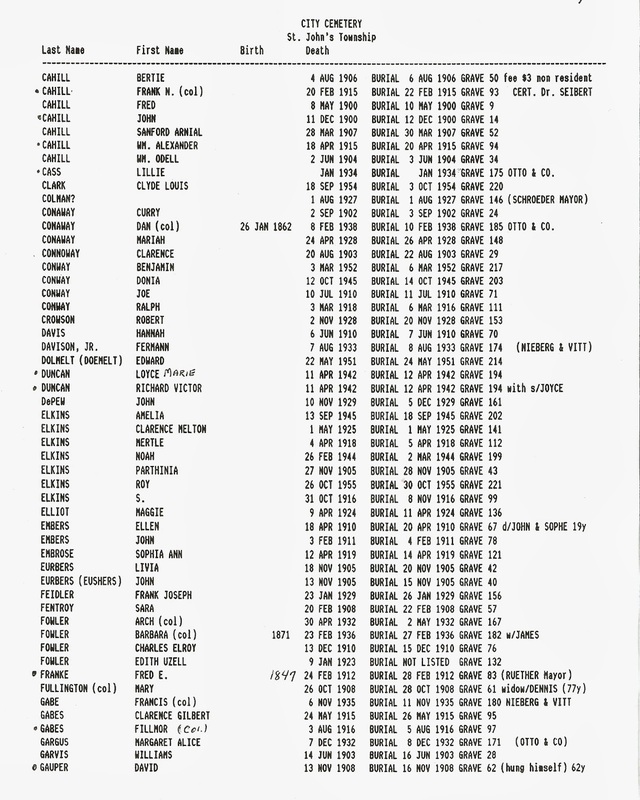 I was curious to find out more about the location of the cemetery's and my relatives. Called Washington and Old City Cemetery. I received an email from a woman asking me if I was sure about the name of this cemetery. After my reply, She offered to search for cemetery records. I was surprised and very grateful for her kind offer. The next day she emailed me back with not one, not two, but a whole list of names. I recognized the names. Many were my grandmother's family. I was floored when she told that she would search the cemetery over the weekend and try to find their grave sites. WHAT! did I read this right? I thought to myself..okay, surely she charges a fee for her research services. When I asked her, She replied "No" and said that she would be in that area and that it wasn't far from her. The next email a day or two later provided me with more than I expected. 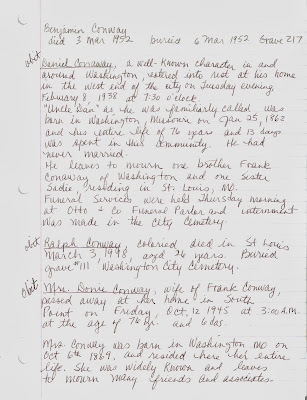 Not only did she walk the cemetery, finding that there was not one single relative that had a headstone, she went to the county office and found obituaries, Birth, death and marriage announcements. I thought to myself, this woman must be a relative of mine. Who would do that? spend their whole weekend searching for a family that's not theirs. 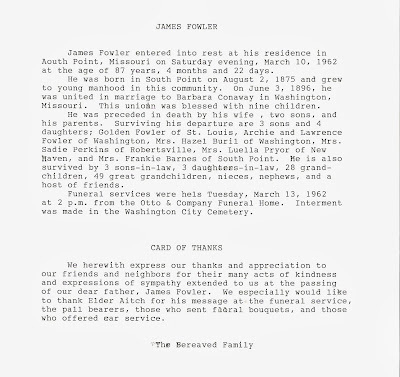 Her final emails contained maps of South Point, Missouri with links to other websites. I never did find out who Melanie was. If she was a relative, or just a kind woman who wanted to help me. I truly appreciate her time and her sacrifice to find these gems of information. This was an act of Genealogical Kindness that I will be sure to pay forward. 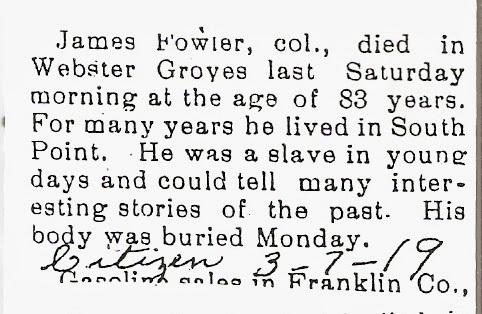 My 2x Great-Grandfather James Fowler Sr.